The components of NeuroRelax act synergistically to support patients' innate ability to achieve a calm, positive, energetic, and productive attitude. As secondary benefits, it contains herbs that improve the ability of people to cope with daily life challenges and enjoy good sleep. Its components are non-addictive and, unlike antidepressant medications, are not known to cause adverse effects on sexual function. 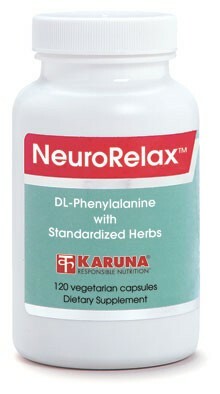 NeuroRelax can be substituted for Piper methysticum (Kava) with patients who are considered inappropriate candidates for this herb. Though relaxing, this formula will actually tend to improve concentration and maintain mental functioning. Passionflower a traditional herb with calming properites (BMC Complement Altern Med 2007;7:26; AANA J 2007;75:333-7. ), compared favorably with oxazepam because it calmed without impairing job performance (J Clin Pharm Ther 2001;26(5):363-7). Rhodiola rosea (Golden Root) has adaptogenic effects on both physical and mental performance (Phytomedicine 2011;18:235-44). Clinical trials found it helped physicians on night duty maintain alertness (Phytomedicine 2000;7: 365-371), motivated medical students preparing for exams (Phytomedicine 2000;7:85-9) and reduced mental fatigue in military cadets (Phytomedicine 2003;10:95-105). Controlled clinical studies with St. John's Wort extract (Cochrane Database Syst Rev 2008;4:CD00448; AM Fam Physician 2005;72:2249-54) and DL-phenylalanine (Arch Psychiatr Nervenkr 1979;227:49-58) have demonstrated that these agents help support normal psychological mood. Suggested use for adults: Two capsules twice daily, away from meals, or as directed. Warning: Do not use if pregnant, or with MAO inhibitors.